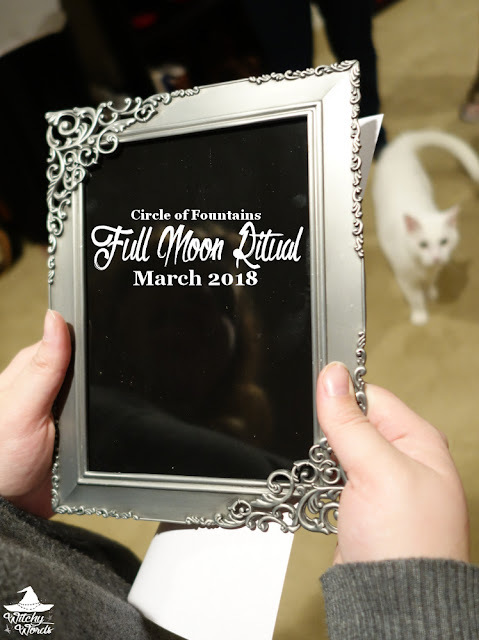 On Sunday, March 4th, Circle of Fountains met to celebrate the first March full moon and work on the Noviceship courses for 2019! Our very own handmade scrying mirrors! Abby went out of her way to painstakingly create each one. We were able to choose our own by standing in front of it. To begin, we chanted an altered version of a chant from the Carmina Gadelica, Jewel of Virtues, as seen in Lady of Avalon by Marion Zimmer Bradley. Jewel of guidance, jewel of the night. Come to us, Lady! Let us be Thy mirror! Lady, come down to us! Lady, be with us! Lady, come to us now!" At this point, we raised our scrying mirrors up towards the moon. So may it be with Thy reflection in our hearts. Lady, we call to Thee! Come down to us, be with us here! Let us carry forth that blessing into the world." And with that, our mirrors were charged and ready for scrying! We released the moon and wished the circle hail and farewell. We hope everyone had a wonderful full moon as well! Best wishes to you all!